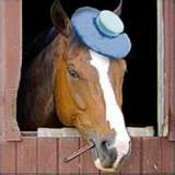 Equine rhinopneumonitis virus, or equine herpesvirus 1(EHV-1) and 4 (EHV-4), causes respiratory disease in horses. In areas of high horse concentration, outbreaks are very common, especially among young horses. In one study 100% of horses had been exposed to EHV at some time in their lives. EHV-4 primarily causes respiratory disease, while EHV-1 can cause respiratory disease, abortion, or paralysis. EHV can spread rapidly in a barn, especially if the horses are in crowded conditions. Some horses will contract EHV and have no symptoms (latent infections). These latent infected horses can reactivate without clinical signs but still be contagious. Under stressful conditions such as transport, competition, or sale latent horses can break with symptoms. Typical clinical signs include fever (102 degrees to 106 degrees F), congestion, loss of appetite, serous nasal and ocular discharge, depression, swollen limbs, and swollen lymph nodes. Symptoms can last for a few days up to a month. A cough can develop in the later stages of the disease. Secondary bacterial infections can occur, further complicating the disease progression and recovery. Some horses develop performance limiting inflammatory airway disease. Because immunity after natural infection or vaccination is brief (less than 60 days), horses that have had EHV can become reinfected. Treatment includes; fever control, immunostimulants, antiviral medication, discontinue work, increase ventilation, and decrease dust. In addition antibiotics may be used to prevent or treat secondary bacterial infection. Because treatment options are limited, prevention is the best approach. Vaccinations should include all horses on the premises. Booster vaccines are important before horses gather in new places such as shows, sales, clinics, or reproductive facilities. Horses in high risk groups may need vaccinated as frequently as every 60 days. Infected horses should be isolated from healthy horses. Keep stalls well ventilated and dust free. Do not share feed or water facilities. Wash all surfaces that come in contact with infected horses thoroughly. Feed or treat infected horses last, after all the healthy horses in the barn have been attended too. New horses introduced into a herd or coming home from a "high risk" event should be isolated for up to six weeks. Like EHV Equine Influenza (EIV) is a highly contagious respiratory disease in horses. EIV can spread throughout a barn, horse show, or sale because a horse can be infected and not yet show clinical signs but are very contagious to other horses. Unlike EHV, EIV is not capable of prolonged survival in individual animals or in the environment. Transmission of the virus among horses generally occurs via direct contact with nasal secretions, by the aerosol route, or through contact with recently contaminated surfaces. Clinical signs tend to be similar to those of EHV; however horses with EIV tend to have more intense symptoms. They can develop a high fever, harsh cough, heavy nasal discharge, enlarged lymph nodes, swollen limbs, and difficult breathing. Secondary bacterial infection is more common in horses that contract EIV and can start in as little as 48 hours. 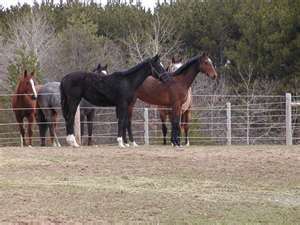 Some horses with EIV can take months to fully recover. The most severely infected horses can develop secondary pneumonia, and even die. Treatment is also similar to EHV affected horses. Rest and supportive care is important. Fever control, immunostimulants, and antiviral medications are also recommended. In addition antibiotics to prevent or treat secondary bacterial infection are indicated. Like EHV infection prevention is better than treatment. The same hygiene and isolation protocols as discussed above should be implemented. Vaccination against EIV should be given to every horse that will encounter other horses at least twice per year. Horses in high risk groups should be vaccinated more frequently. Discuss with your veterinarian an appropriate vaccination protocol to protect your horses from EHV and EIV infections.